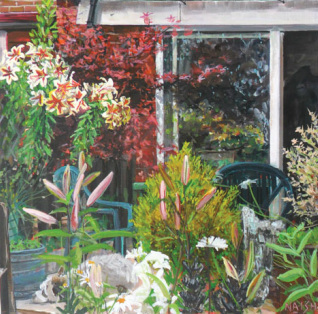 A day up at my uncle’s in Belper was a chance to sit in his garden and take in the late summer sun and paint. As ever with painting live, the sun changes and travels around so you sometimes worry that parts of the picture have different shadows. The dog positioning was rather serendipitous as he wasn’t there when I started. Indeed I was at first more concerned that he was moving the chair around that I was trying to paint, when he arrived but I soon realised he was worth photographing to be added at a later date. The post-production on this took slightly longer than I had hoped, the piece needed sharpening up – but I couldn’t quite get it sharp enough. I even worried that I needed a better centre of interest thinking that I would have to go back up and photograph the back up someone’s head sat in one of the garden seats. The other thought I had was to add a mysterious figure or reflection in the window. I ended up by adding clarity to the window reflections and re-doing the pale yellow and red flowers top left.